Monsters. Ghosts. Zombies. From horror movies to Halloween, we see the creatures that go bump in the night everywhere, but where did they come from? The primal fears of our ancestors fueled the stories that lived on through spoken legends, in print, and on the screen. Join us as we peer into the histories of some of the most prevalent creatures in pop culture, including vampires, werewolves, zombies, and ghosts. 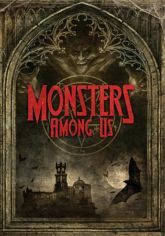 Come and meet the monsters among us�if you dare.